Perform this drive pattern on a level surface and strictly observe the posted speed limits and traffic laws while driving. Performing this drive pattern is one method to simulate the ect's malfunction detection conditions. The dtcs may not be detected through ordinary, everyday driving. Also, dtcs may not be detected through this drive pattern. Warm up the engine sufficiently (engine coolant temperature is 60°c (140°f) or higher). Drive the vehicle when the atmospheric temperature is -10°c (14°f) or higher. Malfunction is not detected when the atmospheric temperature is less than -10°c (14°f). Drive the vehicle through all the gears. Stop→1st → 2nd →3rd → o/d → o/d (lock-up on). Repeat the above drive pattern 3 times or more. When using the intelligent tester, the monitor status can be found in "enhanced obd ii / data list" or under "carb obd ii". In the event that the drive pattern must be interrupted (due to traffic conditions or other factors), the drive pattern can be resumed and, in most cases, the monitor can be completed. Perform this drive pattern on a level road as much as possible and strictly observe the posted speed limits and traffic laws while driving. *: Drive at such a speed in the uppermost gear to engage lock-up. 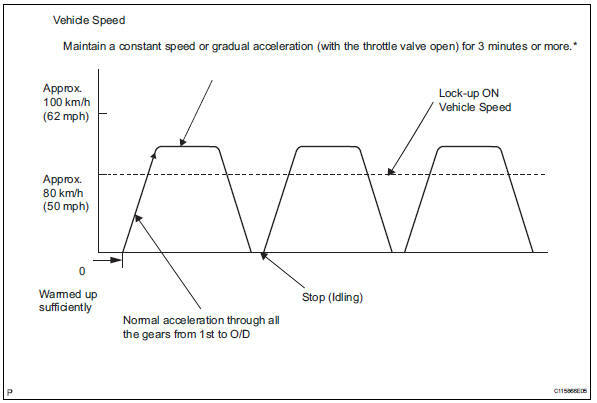 The vehicle can be driven at a speed lower than the speed shown in the above diagram under the lock-up condition. It is necessary to drive the vehicle for approximately 30 minutes to detect dtc p0711 (transmission fluid temperature sensor "a" performance).